I got this engine and transmission yesterday. When this automatic goes out I’m swapping to this manual. I only wanted the transmission but he basically offered me the engine for free. I decided I could use some of thes brackets on the motor that are basically made of unobtanium these days. This guy told me the truck had 90k on it. That’s a lie, cause I saw the cluster and it said 220k. I didn’t really cry too much considering I knew I could scrap the block and I stood to get some extra hard to find parts. I was blown away by the sludge in this lifter valley. I couldn’t believe it. The amount of grit was unbelievable. The block actually looks ok. I had to take the heads and intake off as a unit as it was basically glued together. Took me 20 minutes to separate them! It appears he meant it was 90k since the last oil change. 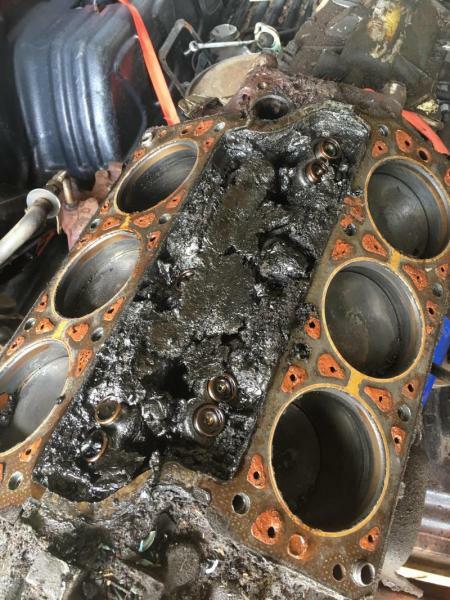 He swears it was running and running well. How I am not sure. Oil however looked clean. I don’t understand how someone can abuse something like this. You sure you want a trans with 220K on it? One that likely has been touched since the assembly line? Yeah. I checked it out pretty well. It’s solid. Even if I had to rebuild this unit, it’s better than building another automatic. I’ve rebuilt this one twice and it still feels “not right” to me. Output bearing is tight, and shifter is tight. I’ve found that these hold up pretty dang good unless you’re out abusing them. IE snatching gears etc. "He meant 90,000 miles since last oil change," Now that's funny! I had a 72 Pontiac Le Mans come into the shop. Pontiac 350, convertible, body very nice. Skipping like a piglet. I located the problem: # 4 not firing. Wasn't ignition. Pulled the intake and it was not better. Anyway, removed two shoe boxes of mud! Pulled the cam, it had one perfectly round lobe (#4) and 3 marginal lobes - half round. I had a used cam from a hipo 421 out of a 65 2+2, installed it with new lifters and a double row timing chain. It was a 2 barrel 350, and it SCREAMED!! Spark the treads easily. The idle was very mildly choppy, but with a single exhaust it was almost not noticeable. Moral of story... even though the engine had a mud bath going on, it still ran way well. A friend of mine had a 97 astro since new and that engine was lucky to see oil changes once every couple years of so... Some of his intervals went 20-30k Kms... on the low side! That van got stripped at 500,000km (310,000mi) and looked exactly like what you got. And yes, It ran like a clock shockingly, I don't know how. 3 transmissions he put in that van. So yea, I could slightly believe that this engine you got did have 90,000mi (since the last service) and ran good lol. Started out Quaker State; now it's Quaker Oats! Yeah, it might be good...I might offer it "as is" block and see if someone wants to build it. Cylinders look good. Heads too.